Euro gold climbed to over €1315, platinum gained $4 to $1411.50, and copper rose slightly to about $3.43. Gold and silver equities rose about 1.5% by midmorning and remained near that level for the rest of the day. Tomorrow at 8:30AM EST brings Import and Export Prices for July and at 2PM is the Treasury Budget for July expected at -$71.0 billion. Oil traded mostly slightly higher on weaker than expected economic data out of China that increased possibilities for more monetary easing from the PBOC. The U.S. dollar index rose as the euro dropped on uncertainty about when or how exactly the ECB will act. Treasuries fell on doubts over whether or not the fed will participate in any additional bond buying anytime soon, but they did pare their losses after today’s $16 billion 30-year note auction sold at a high yield of 2.825% with a bid to cover of 2.41. The Dow, Nasdaq, and S&P waffled near unchanged on mixed expectations about what the world’s central banks will do. Among the big names making news in the market today were National Oilwell and Robbins & Myers, Goldman Sachs, E*Trade, and Standard Chartered. “US centered investors/traders more often than not develop a US Dollar-centric view of the price of commodities, gold included. As such we oftentimes can miss how a large portion of the global investment community can be viewing the price action of an individual asset. It is no secret that the current epicenter for global economic troubles is Europe. Sovereign debt woes and squabbles among the various members of the EU have led to a sort of impasse which is sapping confidence from investors in that corner of the world. The result has been a significant amount of gold buying as a safe haven among Europeans. This is quite noticeable when one compares the current chart of gold priced in Euros to a gold chart priced in US Dollar terms. 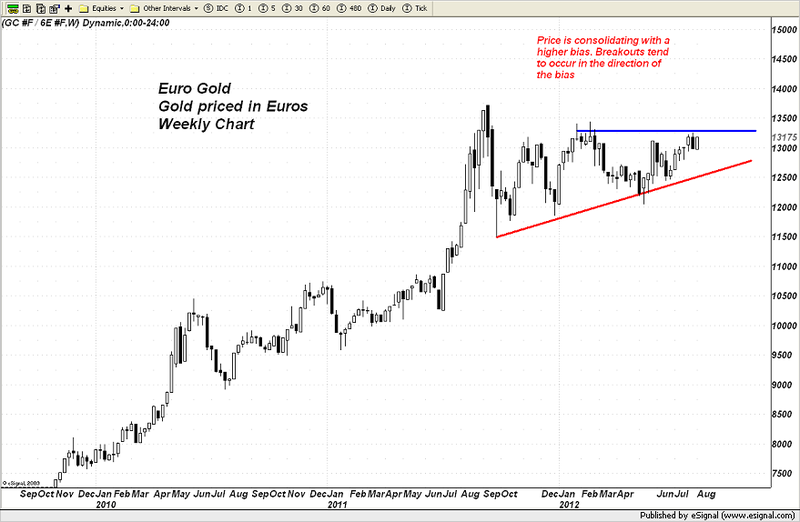 Frankly, Euro gold has a much stronger chart than US Dollar priced gold currently has. As a matter of fact, you can see from the following chart, that Euro Gold is a mere 50 euros or so just off its all time high! 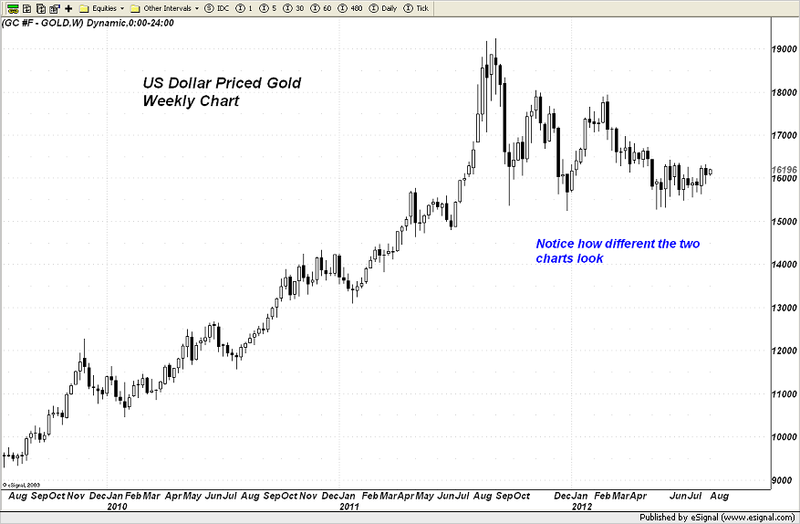 Compare that to US Dollar priced gold which is currently trading closer to $300 off its best all time level. COMEX Gold Trust (IAU) Total Tonnes in Trust: 183.60: +0.74 change from yesterday’s data. Silver Trust (SLV) Total Tonnes in Trust: 9,742.43: No change from yesterday’s data. Lake Shore’s (LSG) second quarter results, Royal Gold’s (RGLD) fourth quarter results and increased gold stream interest, Comstock’s (LODE) commenced mining operations, Aurizon’s (AZK) second quarter results, Vista Gold’s (VGZ) assay results, Kinross Gold’s (KGC) senior management appointments, Revett’s (RVM) second quarter results, and Excellon’s (EXN.TO) second quarter results were among the big stories in the gold and silver mining industry making headlines today.